Previously known as National Organic Cereals, this years flagship OF&G event will be hosted by John Pawsey – Shimpling Park Farm, near Bury St Edmunds. John has 1500 acres managed under organic licence with OF&G, with more acreage at other sites. John is running a mainly arable unit and has recently introduced livestock back on to the family farm for the first time since the 1960s. His flock of New Zealand Romney sheep are settling in well and are part of ORC's Grazing Cereals project funded by the Duchy Originals Future Farming Programme (DOFF), looking at bringing livestock on to an arable unit and the effects of grazing on blackgrass in arable rotations. There will be an opportunity to view organic crop trials with Organic Seed Producers including seed varieties of cereals, as well as proteins, cover crops, legumes and novel crops (including the very up and coming gluten-free quinoa), along with ORC's COBRA trials. These consist of lines and mixtures of winter wheat originally selected from the YQCCP (one of ORC's very diverse populations, derived from 20 parent varieties under organic conditions). 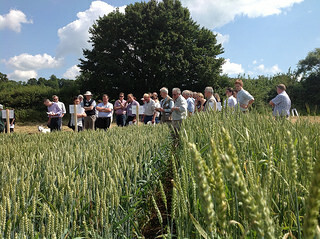 The winner of ORC's Name our wheat population competition will be revealed. As usual delegates will be taken round the farm on a guided farm walk where they will be able to see and to discuss key aspects of organic farming. There will also be talks from experienced members of the organic sector in business, policy and research, and the wider food and farming industry to help us all look in detail at key topics including soil health, farm business management and retail markets. Over 200 people attend this annual event. Booking in advance is necessary; for more information and to register go to http://www.organicfarmers.org.uk/national-organic-combinable-crops-2015/. Report and links to presentations from the 2014 event.